« Meat Is Murder. Delicious Murder. Have You Time For A Long Story? Don’t ever leave me free to spend a few hours browsing the web with no responsibilities. Word vomits like this are the inevitable result. In the previous entry I wrote about orthodoxy, inspired by the Corkonian clown Bob. He had written about Karl Barth. To understand Barth’s impact on the Christian world, we have to tell a story. Let me bring you up to speed as quickly and as easily as I can. For a very long time, theologians didn’t do a very good job of thinking for themselves. Surprisingly, that doesn’t mean they just repeated the clerics’ line over and over. They went the other way after a very influential man called Feuerbach wrote a book that undermind a lot of the traditional ideas held about the Gospel. Rather than read the book, you could just read some pop song lyrics like Save Me, by Dave Matthews. I don’t think the DMB formed a little impromptu theological seminar before writing that song but the effects of this theological movement have filtered down so thoroughly that we all have the ideas hibernating somewhere in the back of our big empty heads. So this movement can loosely be called liberal theology. That doesn’t mean that they were interested in writing theology that spoke into people’s rights for self determination. It has no connection with liberal politics. Interestingly, liberal theology historically fed into the most socially repressive societies. Liberal theology was liberal with the central tenets of Christianity as it had been expressed over the previous 1800 years. And once this movement started rolling it rolled up everything in its path, miraculously (of course they didn’t believe in miracles) gathering all the moss in the theology world. Liberal theology became all the theology there was really. And then after World War I a new movement arose led by a witty, verbose Swiss man called Karl Barth. 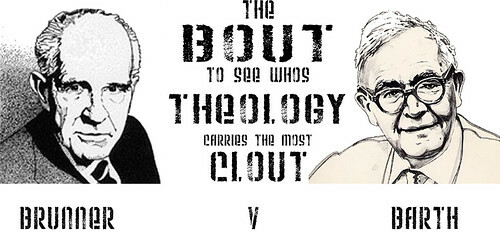 BRUNNER V BARTH, a t-shirt created by my genius friend in one of his inspired Final Year Project tangents. This Barth guy wrote a lot. I think it was about 12000 words a day, on an average day. And he’d write while listening to Mozart (He said: “It may be that when the angels go about their task of praising God, they play only Bach. I am sure, however, that when they are together en famille they play Mozart and that then too our dear Lord listens with special pleasure.”) because you can’t dare write about the Creator God without revelling in the creative abilities he has bestowed on us. This Barth lad was thoroughly schooled in the Liberal theological methods and saw their failings firsthand in the destiny assumptions that Germans held in the First World War. So when his time to shine came round he delivered a series of fatal blows to liberal theology as it was then known (it got back up and in the last few years NT Wright has been hitting it to death again in different ways). I am in no way entitled to have an opinion on the key aspects of Barth’s thought. But I will paint a very vague outline of what he said that was so marvellous. Three things might set up the conversation right. Barth remembered that God was so very different from man that any efforts to portray him systematically or any theological project to map his dimensions was bound to fail. Humanity can only think about God in human terms. Our reasoning is never going to work up to God of its own accord. God can’t be fit inside a box created by his creations. Barth understood that Christianity is not friends with the world but is at war with it. The Christian is a subversive, dangerous contagion in society that, living properly, should be totally distrusted by the powers that be. The call of Christ is a revolutionary one. The Kingdom of God is a time when God is King of the world, not capital or lust or power and Christians are the resistance movement seeking to liberate the world from these imperialists. Barth stood firmly with any Christians who felt that their faith could not be a private thing but had to be expressed in action- political, creative, every kind of action that expresses solidarity with the poor and the oppressed, the blind and the lame, the sinners and the untouchables, with everyone in their brokeness. Barth’s most famous catch phrase is that the modern Christian should have a Bible in one hand and a newspaper in the other. The Bible is to remind us of the redemption song God is singing and the newspaper is to remind us of the battle we have to fight today. Finally, Barth was all about the Word of God. It is madly complex. It took him 14 volumes to work it out and he never got them finished, but for Barth, God has revealed himself to humanity, ultimately, when he Himself came as Jesus the Christ, who was a man who cut wood very nicely in Palestine. The Bible is the account of this revelation. And if you can’t base your arguments from these strange and wonderful 66 books then your argument is worthless. So now you are caught up. Barth was the David who killed the liberal theological Goliath with a stone made up of (for our purposes) 3 parts: God’s awesomeness, our enemy-of-every-state status, and the fact that we only know about God because he has revealed himself to us. Heresy-hunting quickly becomes a heresy. Knocking out the million-word work of Barth’s life because he doesn’t read Scripture the same way Francis Schaeffer does is probably closer to heterodox (those loony dissident ideas) than I’d ever like to be. Ah well. My brain is hot. Your eyes are sad. Life goes on even though some people are wrong. Thankfully, you and I are never in that category. This entry was posted on Wednesday, August 23rd, 2006 at 7:08 pm and is filed under Cross Shaped Waffle. You can follow any responses to this entry through the RSS 2.0 feed. Both comments and pings are currently closed.